Maddie & Tae achieved their first number one when they topped the Country Airplay chart with "Girl in a Country Song", a response to the prevalent bro-country style. In 2014, Billboard magazine published two main charts ranking the top-performing country music songs in the United States. The Hot Country Songs chart ranked songs based on digital downloads, streaming, and airplay not only from country stations but from stations of all formats, a methodology introduced in 2012. The Country Airplay listing, which had been published for the first time in 2012, was based solely on country radio airplay, a methodology which had previously been used for several decades for Hot Country Songs. In 2014, 13 different songs topped the Hot Country Songs chart and 35 different songs topped Country Airplay in 52 issues of the magazine. 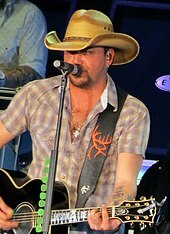 Jason Aldean had the longest unbroken run at number one on the Hot Country Songs, spending 14 consecutive weeks in the top spot with "Burnin' It Down". Luke Bryan spent the most total weeks at number one during the year, however. His songs "Drink a Beer" and "Play It Again" totaled 14 weeks atop the chart and he spent a further six weeks in the top spot as a featured vocalist on Florida Georgia Line's chart-topper "This Is How We Roll" for a total of 20 weeks at number one. Bryan and Florida Georgia Line were the acts with the most number ones during 2014, as each act had two chart-toppers in addition to their collaboration on "This Is How We Roll". No other act had more than one number one during the year. Bryan also spent the most weeks at number one on the Country Airplay listing, but with a much smaller total of seven weeks. This figure included a run of four consecutive weeks with "Play It Again", which tied with Florida Georgia Line's "Stay" for the longest unbroken run at the top of the radio-based chart during 2014. Bryan and Florida Georgia Line were among a number of acts with two number ones on that chart, including Aldean, Frankie Ballard and Dierks Bentley. Blake Shelton, however, had the highest number of chart-toppers on the airplay listing, reaching the top spot with "Doin' What She Likes", "Neon Light" and "My Eyes". Several acts gained their first number ones during 2014, including Sam Hunt, whose "Leave the Night On" topped both charts in the same week in November. Singer Cole Swindell reached the top of the Hot Country Songs listing with his debut single, "Chillin' It". Frankie Ballard achieved his first career number one when he reached the peak position on Country Airplay with "Helluva Life", and went on to gain his second number one on the same chart later in the year with "Sunshine & Whiskey". Former contestant on TV's The Voice Gwen Sebastian was a first-time chart-topper when she was featured on the song "My Eyes" by Blake Shelton, who had coached her on the show. "Where It's At" gave Dustin Lynch his first appearance at number one. Finally, teenaged female duo Maddie & Tae reached number one for the first time with "Girl in a Country Song", a retort to the bro-country sub-genre associated with acts such as Florida Georgia Line and Jason Aldean, and in particular the depiction of women in the style's lyrics. Jason Aldean's "Burnin' It Down" spent 14 consecutive weeks at number one. Carrie Underwood topped the chart in December with "Something in the Water". Frankie Ballard had two number ones on the airplay chart. 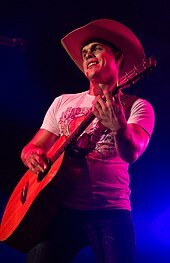 Dustin Lynch achieved his first number one with "Where It's At". ^ D., Nicki (October 30, 2015). "Sam Hunt's Free Concert in Nashville Brings Out 10,000 Fans". Taste of Country. Townsquare Media. Retrieved October 18, 2018. ^ Mansfield, Brian (February 16, 2014). "On the Verge: Cole Swindell no longer cooling his heels". USA Today. Retrieved October 18, 2018. ^ Leahey, Andrew (January 9, 2015). "Frankie Ballard Serves Up 'Sunshine & Whiskey' on 'Jimmy Kimmel Live'". Rolling Stone. Retrieved October 18, 2018. ^ "Gwen Sebastian Chart History". Billboard. Retrieved October 18, 2018. ^ Thompson, Gayle (April 6, 2014). Boot "Blake Shelton and Gwen Sebastian Perform 'My Eyes' at ACMs" Check |url= value (help). Townsquare Media. Retrieved October 18, 2018. ^ Leight, Elias (July 8, 2015). "Dustin Lynch on the Platinum-Seller That Almost Wasn't". Rolling Stone. Retrieved October 18, 2018. ^ Gore, Sydney (March 8, 2018). "Aux Cord: 10 Songs To Kick Off Your International Women's Day". MTV. Retrieved October 18, 2018. ^ Hight, Jewly (July 15, 2014). "Maddie & Tae Fire a Shot at 'Bro Country'". Rolling Stone. Retrieved October 17, 2018. ^ "Country Songs chart for January 4, 2014". Billboard. Retrieved December 27, 2013. ^ "Country Songs chart for January 11, 2014". Billboard. Retrieved January 3, 2014. ^ "Country Songs chart for January 18, 2014". Billboard. Retrieved January 9, 2014. ^ "Country Songs chart for January 25, 2014". Billboard. Retrieved January 16, 2014. ^ "Country Songs chart for February 1, 2014". Billboard. Retrieved January 23, 2014. ^ "Country Songs chart for February 8, 2014". Billboard. Retrieved January 30, 2014. ^ "Country Songs chart for February 15, 2014". Billboard. Retrieved February 6, 2014. ^ "Country Songs chart for February 22, 2014". Billboard. Retrieved February 13, 2014. ^ "Country Songs chart for March 1, 2014". Billboard. Retrieved February 20, 2014. ^ "Country Songs chart for March 8, 2014". Billboard. Retrieved February 27, 2014. ^ "Country Songs chart for March 15, 2014". Billboard. Retrieved March 6, 2014. ^ "Country Songs chart for March 22, 2014". Billboard. Retrieved March 13, 2014. ^ "Country Songs chart for March 29, 2014". Billboard. Retrieved March 20, 2014. ^ "Country Songs chart for April 5, 2014". Billboard. Retrieved March 27, 2014. ^ "Country Songs chart for April 12, 2014". Billboard. Retrieved April 3, 2014. ^ "Country Songs chart for April 19, 2014". Billboard. Retrieved April 10, 2014. ^ "Country Songs chart for April 26, 2014". Billboard. Retrieved April 17, 2014. ^ "Country Songs chart for May 3, 2014". Billboard. Retrieved April 24, 2014. ^ "Country Songs chart for May 10, 2014". Billboard. Retrieved May 1, 2014. ^ "Country Songs chart for May 17, 2014". Billboard. Retrieved May 8, 2014. ^ "Country Songs chart for May 24, 2014". Billboard. Retrieved May 15, 2014. ^ "Country Songs chart for May 31, 2014". Billboard. Retrieved May 22, 2014. ^ "Country Songs chart for June 7, 2014". Billboard. Retrieved May 29, 2014. ^ "Country Songs chart for June 14, 2014". Billboard. Retrieved June 5, 2014. ^ "Country Songs chart for June 21, 2014". Billboard. Retrieved June 12, 2014. ^ "Country Songs chart for June 28, 2014". Billboard. Retrieved June 19, 2014. ^ "Country Songs chart for July 5, 2014". Billboard. Retrieved June 26, 2014. ^ "Country Songs chart for July 12, 2014". Billboard. Retrieved July 3, 2014. ^ "Country Songs chart for July 19, 2014". Billboard. Retrieved July 10, 2014. ^ "Country Songs chart for July 26, 2014". Billboard. Retrieved July 17, 2014. ^ "Country Songs chart for August 2, 2014". Billboard. Retrieved July 24, 2014. ^ "Country Songs chart for August 9, 2014". Billboard. Retrieved July 31, 2014. ^ "Country Songs chart for August 16, 2014". Billboard. Retrieved August 7, 2014. ^ "Country Songs chart for August 23, 2014". Billboard. Retrieved August 14, 2014. ^ "Country Songs chart for August 30, 2014". Billboard. Retrieved August 21, 2014. ^ "Country Songs chart for September 6, 2014". Billboard. Retrieved August 28, 2014. ^ "Country Songs chart for September 13, 2014". Billboard. Retrieved September 4, 2014. ^ "Country Songs chart for September 20, 2014". Billboard. Retrieved September 11, 2014. ^ "Country Songs chart for September 27, 2014". Billboard. Retrieved September 18, 2014. ^ "Country Songs chart for October 4, 2014". Billboard. Retrieved September 25, 2014. ^ "Country Songs chart for October 11, 2014". Billboard. Retrieved October 2, 2014. ^ "Country Songs chart for October 18, 2014". Billboard. Retrieved October 9, 2014. ^ "Country Songs chart for October 25, 2014". Billboard. Retrieved October 16, 2014. ^ "Country Songs chart for November 1, 2014". Billboard. Retrieved October 23, 2014. ^ "Country Songs chart for November 8, 2014". Billboard. Retrieved October 30, 2014. ^ "Country Songs chart for November 15, 2014". Billboard. Retrieved November 6, 2014. ^ "Country Songs chart for November 22, 2014". Billboard. Retrieved November 13, 2014. ^ "Country Songs chart for November 29, 2014". Billboard. Retrieved November 20, 2014. ^ "Country Songs chart for December 6, 2014". Billboard. Retrieved December 1, 2014. ^ "Country Songs chart for December 13, 2014". Billboard. Retrieved December 8, 2014. ^ "Country Songs chart for December 20, 2014". Billboard. Retrieved December 15, 2014. ^ "Country Songs chart for December 27, 2014". Billboard. Retrieved December 22, 2014. ^ "Country Airplay chart for January 4, 2014". Billboard. Retrieved December 30, 2013. ^ "Country Airplay chart for January 11, 2014". Billboard. Retrieved January 6, 2013. ^ "Country Airplay chart for January 18, 2014". Billboard. Retrieved January 13, 2013. ^ "Country Airplay chart for January 25, 2014". Billboard. Retrieved January 20, 2014. ^ "Country Airplay chart for February 1, 2014". Billboard. Retrieved January 27, 2014. ^ "Country Airplay chart for February 8, 2014". Billboard. Retrieved February 3, 2014. ^ "Country Airplay chart for February 15, 2014". Billboard. Retrieved February 10, 2014. ^ "Country Airplay chart for February 22, 2014". Billboard. Retrieved February 18, 2014. ^ "Country Airplay chart for March 1, 2014". Billboard. Retrieved February 24, 2014. ^ "Country Airplay chart for March 8, 2014". Billboard. Retrieved March 3, 2014. ^ "Country Airplay chart for March 15, 2014". Billboard. Retrieved March 10, 2014. ^ "Country Airplay chart for March 22, 2014". Billboard. Retrieved March 17, 2014. ^ "Country Airplay chart for March 29, 2014". Billboard. Retrieved March 24, 2014. ^ "Country Airplay chart for April 5, 2014". Billboard. Retrieved March 31, 2014. ^ "Country Airplay chart for April 12, 2014". Billboard. Retrieved April 7, 2014. ^ "Country Airplay chart for April 19, 2014". Billboard. Retrieved April 14, 2014. ^ "Country Airplay chart for April 26, 2014". Billboard. Retrieved April 21, 2014. ^ "Country Airplay chart for May 3, 2014". Billboard. Retrieved April 28, 2014. ^ "Country Airplay chart for May 10, 2014". Billboard. Retrieved May 5, 2014. ^ "Country Airplay chart for May 17, 2014". Billboard. Retrieved May 12, 2014. ^ "Country Airplay chart for May 24, 2014". Billboard. Retrieved May 19, 2014. ^ "Country Airplay chart for May 31, 2014". Billboard. Retrieved May 26, 2014. ^ "Country Airplay chart for June 7, 2014". Billboard. Retrieved June 2, 2014. ^ "Country Airplay chart for June 14, 2014". Billboard. Retrieved June 9, 2014. ^ "Country Airplay chart for June 21, 2014". Billboard. Retrieved June 16, 2014. ^ "Country Airplay chart for June 28, 2014". Billboard. Retrieved June 23, 2014. ^ "Country Airplay chart for July 5, 2014". Billboard. Retrieved July 8, 2014. ^ "Country Airplay chart for July 12, 2014". Billboard. Retrieved July 8, 2014. ^ "Country Airplay chart for July 19, 2014". Billboard. Retrieved July 17, 2014. ^ "Country Airplay chart for July 26, 2014". Billboard. Retrieved July 21, 2014. ^ "Country Airplay chart for August 2, 2014". Billboard. Retrieved July 29, 2014. ^ "Country Airplay chart for August 9, 2014". Billboard. Retrieved August 5, 2014. ^ "Country Airplay chart for August 16, 2014". Billboard. Retrieved August 12, 2014. ^ "Country Airplay chart for August 23, 2014". Billboard. Retrieved August 21, 2014. ^ "Country Airplay chart for August 30, 2014". Billboard. Retrieved August 25, 2014. ^ "Country Airplay chart for September 6, 2014". Billboard. Retrieved September 1, 2014. ^ "Country Airplay chart for September 13, 2014". Billboard. Retrieved September 8, 2014. ^ "Country Airplay chart for September 20, 2014". Billboard. Retrieved September 15, 2014. ^ "Country Airplay chart for September 27, 2014". Billboard. Retrieved September 23, 2014. ^ "Country Airplay chart for October 4, 2014". Billboard. Retrieved September 29, 2014. ^ "Country Airplay chart for October 11, 2014". Billboard. Retrieved October 6, 2014. ^ "Country Airplay chart for October 18, 2014". Billboard. Retrieved October 20, 2014. ^ "Country Airplay chart for October 25, 2014". Billboard. Retrieved October 20, 2014. ^ "Country Airplay chart for November 1, 2014". Billboard. Retrieved October 27, 2014. ^ "Country Airplay chart for November 8, 2014". Billboard. Retrieved November 3, 2014. ^ "Country Airplay chart for November 15, 2014". Billboard. Retrieved November 12, 2014. ^ "Country Airplay chart for November 22, 2014". Billboard. Retrieved November 17, 2014. ^ "Country Airplay chart for November 29, 2014". Billboard. Retrieved November 24, 2014. ^ "Country Airplay chart for December 6, 2014". Billboard. Retrieved December 1, 2014. ^ "Country Airplay chart for December 13, 2014". Billboard. Retrieved December 8, 2014. ^ "Country Airplay chart for December 20, 2014". Billboard. Retrieved December 15, 2014. ^ "Country Airplay chart for December 27, 2014". Billboard. Retrieved December 22, 2014. This page was last edited on 9 November 2018, at 16:05 (UTC).